irandoost, F. (2015). The effectiveness of Group Acceptance and Commitment Therapy (ACT) on pain related anxiety and depression in women with chronic low back pain. International Journal of Behavioral Sciences, 9(1), 1-8.
foroozan irandoost. "The effectiveness of Group Acceptance and Commitment Therapy (ACT) on pain related anxiety and depression in women with chronic low back pain". 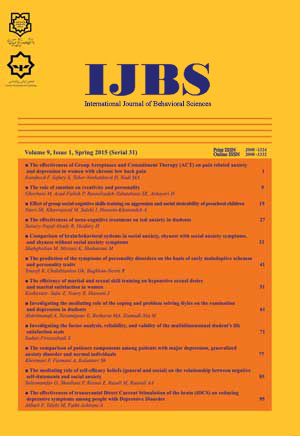 International Journal of Behavioral Sciences, 9, 1, 2015, 1-8.
irandoost, F. (2015). 'The effectiveness of Group Acceptance and Commitment Therapy (ACT) on pain related anxiety and depression in women with chronic low back pain', International Journal of Behavioral Sciences, 9(1), pp. 1-8.
irandoost, F. The effectiveness of Group Acceptance and Commitment Therapy (ACT) on pain related anxiety and depression in women with chronic low back pain. International Journal of Behavioral Sciences, 2015; 9(1): 1-8. Introduction: Acceptance and commitment therapy (ACT) is one of the third wave's cognitive behavioral therapies and is currently being used in the treatment of a number of psychological conditions and disorders. It also enhances psychological flexibility and subsequently improves patients' mental health. The present research was conducted in order to study the effect of ACT on pain related anxiety and depression in chronic low back pain females in Isfahan.Method: This was a semi-experimental research, and a pre-test, post-test design with a control group was applied. Participants included 40 women with chronic low back pain that were selected with a convenience sampling method from three clinical centers and were randomly assigned into control and experimental groups. All the participants completed both the Hospital Anxiety Scale (HAS) and the short Depression Scale as the pre-test and post-test. Afterwards the experimental group participated in 8 sessions of Acceptance and commitment therapy each of which lasted for one hour.Results: Results indicated that there is a meaningful decrease in pain related anxiety and depression, in the experimental group.Conclusion: Generally, the findings of this study show the efficacy of ACT in decreasing the psychological distress in patients with chronic low back pain and also represents new horizons in clinical interventions which can be used as an appropriate intervention.